Recently I had the opportunity to participate in a webinar on achieving international student enrollment goals given by Dr Rahul Choudaha, the CKO of WES (Chief Knowledge Officer of World Education Services). Organized by IEAA Australia, the 1 hour 20 minutes session saw participants from Australia, Singapore, NZ, HK and Malaysia. I found it both educational and enjoyable because I am able to listen to Dr Rahul Choudaha speaking live from New York itself. The wonders of technology and the Internet. This essay reflects on how to prepare for a webinar and the session content and takeaways. All resources provided to me on how to record a webinar has been helpful, but sadly, non-useful. Luckily, the organizer forwarded the recorded session clip and presentation materials to participants after the event. The materials were forwarded two hours immediately after the event ended. I hope all organizers will do the same in other webinars too! Eventually, our university IS office suggested a recording platform called Echo360. Echo360 is a live lecture capturing system that records audio, visuals (slides) and optional videos in a digital format. Launched in 2014 across UNMC, Echo360 is an audio / video recording software that can capture lecture for students who are not able to join classes. I also discovered it to be a very useful computerized video recording tool as well, if you choose not to publish certain recordings that have been recorded because a backup is saved in the computer drive that you are logged in. For my case, it is helpful to capture a live webinar event. I believe with proper editing, processing and archiving, I am able to share events that I have participated to all users on the Echo360 platform. Colleagues can view my published videos online as long as they have an Echo360 account, with technical support by Fazlin from IS office. At the time of writing, my recorded session video is not published yet because of some technical glitches. Rahul started the session by reminding participants on what understanding recruitment trends mean for universities, especially recruiters who today are facing a complex, competitive and changing landscape of global student mobility. How can they maximize resources to achieve international student enrollment goals? Quick fix strategy – Are institutions being reactive towards anecdotal information of market trends, being disjointed in the delivery of student experiences or solely just focusing on the student numbers? Sustainable strategy – Are institutions being proactive in gathering primary research evidence, provide integrated campus services and experience so that students have a seamless student lifecycle and continuously preparing to recruit quality students? How do institutions develop an informed enrollment strategy? Who are the key segments? What type of students are there who is interested in the university? Where are the prioritizing markets? Where are they located within China or India market? What type of students or schools that the recruiter is looking for? How do we reach the relevant channels? How will the university communicate to the specific market? When it comes to understanding student mobility trends, there is a dynamic change on the student mobility trends. In 2009, students generally will prefer to study in the UK and Australia because of the 911 attack in the US and the 2008 global financial crisis. The two global events that happened definitely have affected student decision making to study abroad. During the same period, there is also a rise in student mobility from source countries like China and India heading to the UK, US and Australia because there are significant demographic changes and economic growth within these countries. Rahul emphasized that recruiters should see changes as an opportunity because they are often overlooked in university enrollment strategies. Other contributing factors include economic driver and institutions quality of the destination country, the China effect (at US universities), diaspora (existing community) effect at destination country and student experience. According to a 2012 statistics (UNESCO and World Bank), source and destination countries of globally mobile students to Australia, UK, and the US are primarily from Asia. China ranks at #1 in three destinations, followed by Malaysia and India. He emphasized that with the huge gap in numbers (see slide #18 for the statistics table) between source country #1 and #2 shows that universities need to look beyond China and not depending on it as a primary source of students. Institutions need to be prepared to adopt a proactive approach to cultivating the next sets of market and segments when it comes to international student recruitment. To answer to the question on the next set of growth markets in higher education, a 2013/14 research by WES indicates that it would be Brazil, Vietnam, Indonesia and Nigeria. When it comes to understanding student segments and adapting recruitment strategies, Rahul stressed that doing research in the markets is important for all universities. This will help institutions to prepare and understand who their students are. By asking the right questions and conducting proper segmenting of the information that institutions have will help them to focus on the highest value opportunities rather than reactively acting based on data obtained. According to Rahul further, studies have shown that there are clear differences among potential students. 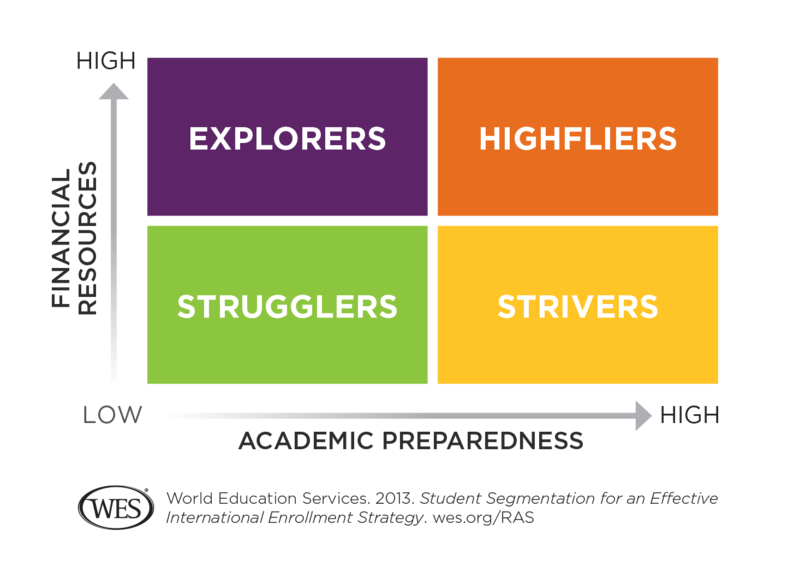 Using a two by two-segmentation framework, Rahul, and his research team identified four types of student categories, the strugglers (immigration), highfliers (prestige), strivers (advancement) and explorers (experience). On reflection, the common theme that bound all participants was our interest and passion for international education and student life cycle in higher education. From maximizing existing resources and asking the right questions on how to achieve sustainable international student enrollment goals, I find it encouraging that all participants from this webinar shared a common interest on this topic. I hope to continue to ‘celebrate student enrollment in higher ed’ with like-minded education practitioners and academics in times to come. Yeong Woon Chin is currently the Research & Executive Administrator for Knowledge Without Borders Network and a Ph.D. candidate in the Faculty of Arts & Social Sciences at The University of Nottingham Malaysia Campus.